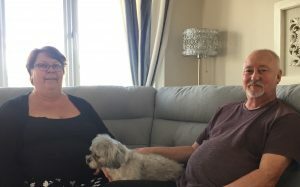 We met up with Sue, John and Archie the dog at Orchard Park to find out how the first 3 years in their new home has been. “Three years on since we purchased our new home on Orchard Park and we are not sure where that time has gone. We have seen the park flourish with new homes and have gained so many new friends. It is certainly a new lifestyle. It feels like we are on a permanent holiday. We have various get togethers and always look out for one another and never a problem if you need help. We have found our home manufacturer Tingdene excellent with aftersales”.